The focus with Tiled 1.2 was generally on improving productivity. It brings improvements to the object tools, introduces multi-layer selection along with multi-tile layer editing, makes it possible to quickly jump between maps in the same world, adds several export options, and includes many smaller changes and fixes. The most notable change will probably be the highlighting of the hovered object, which really helps to know what you will be interacting with when clicking. And when placing new objects, a preview of the object is now always visible, consistent with the tile placement tools. Polygon editing was improved in many ways. You can now click segments to drag or select the points at both ends, or double-click them to split the segment at that location. Quickly switch to the Edit Polygon tool by double-clicking a polygon object, and switch back to the general selection tool by pressing Escape. If there is a selection, Escape clears it. And if you are currently making a change, Escape (or right- click) aborts it. What the above video doesn’t demonstrate, is that you can now also extend a polyline, join two polylines or turn a polyline into a polygon by closing it. Now you can finally select multiple layers at the same time! All relevant actions have been adjusted to apply to all selected layers, and you can change properties on all of them at once. When your game features a large world, which you have split up in multiple maps, it can be difficult to make sure these maps connect properly and it can be time-consuming to search for the right map file. This scenario is now directly supported by the new multi-map world view! The above screenshot shows several maps from Alchemic Cutie. Their world is split up for performance reasons as well as to allow multiple developers to change the world at the same time. All maps in the same world will be loaded together, and it is possible to quickly switch between them while editing by simply clicking them. For now, the world file needs to be written by hand, as defined in the documentation. Several features, like tile property inheritance, object templates and external tilesets, exist to make life easier on the content development side. However, they of course can make it more complicated to incorporate Tiled maps in your game. Developers may need to deal with loading and parsing additional files or implement the same logic used in Tiled to resolve property values. They are applied each time the current map or tileset is exported (without affecting the map itself), and they are also available as options when exporting using the command-line. The JSON map format was simplified a bit, which will require adjustments in the map reader. See its changelog for more information. The Python plugin was updated from Python 2 to Python 3, which will generally require changes to any custom Python plugins. Unfortunately, you also need to install the same minor Python version as the one Tiled was compiled against to be able to use this plugin, which may be a problem especially on Linux. We’ll try to reach broader compatibility in the future. Thanks to everybody who contributed to this release with bug reports, suggestions, patches or translation updates! Support for projects will mostly make it easier to switch between multiple projects, as well as provide quicker access to the resources within your project. Adding scripting to Tiled will make it customizable and extendable in many ways. These are features I’ve long wanted to get around to, and I’m eager to start working on it. If you’re missing something that you could really use in your project, let us know or consider contributing to Tiled! This new release was made possible by nearly 300 patrons supporting me on a monthly basis as well as many people choosing to pay for Tiled on itch.io and some who donated through Liberapay. 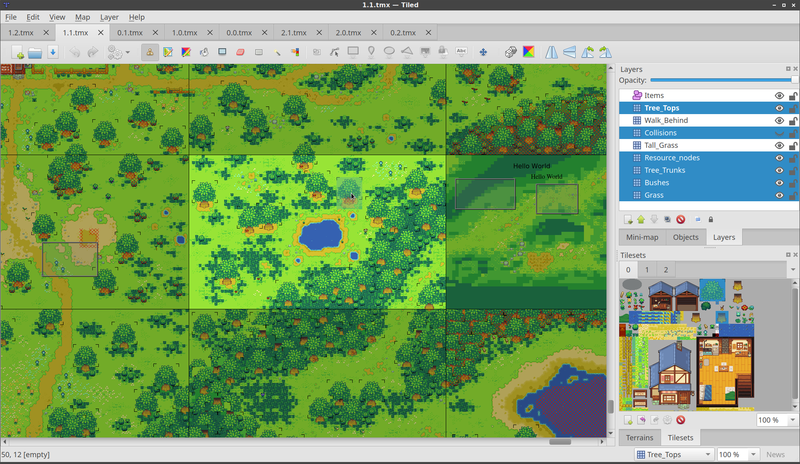 To ensure I will be able to keep developing Tiled at this pace, please chip in! Your donation primarily enables me to work 2 full days/week on Tiled. With additional funds I can place bounties on BountySource to encourage other contributors, or I could spend some additional days on Tiled every once in a while. There’s a lot of work in front of us, but your support makes it doable!